A Sister Remembers Growing Up with the Rev. Dr. Martin Luther King Jr. 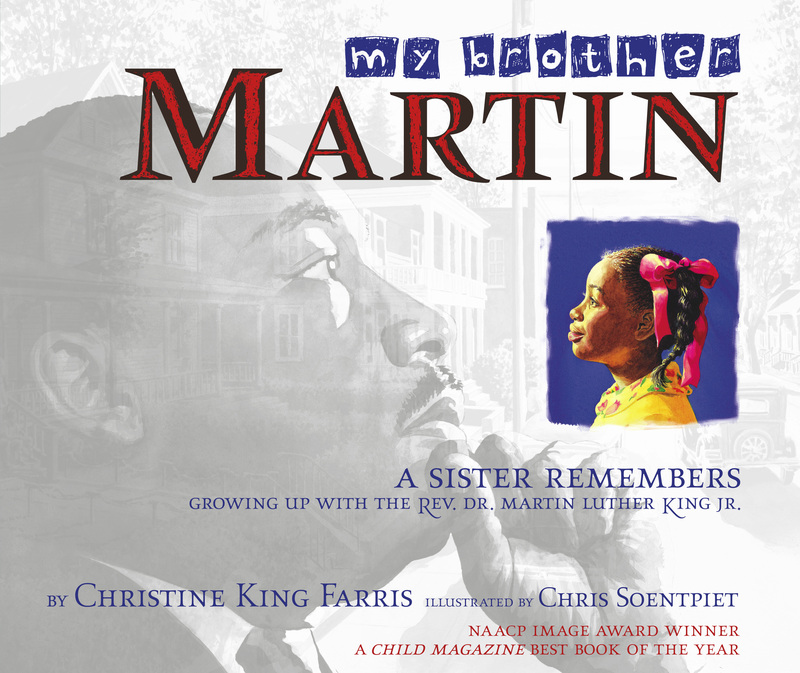 Renowned educator Christine King Farris, older sister of the late Dr. Martin Luther King Jr., joins with celebrated illustrator Chris Soentpiet to tell this inspirational story of how one boyhood experience inspired a movement. Mother Dear, one day I’m going to turn this world upside down. Long before he became a world-famous dreamer, Martin Luther King Jr. was a little boy who played jokes and practiced the piano and made friends without considering race. But growing up in the segregated south of the 1930s taught young Martin a bitter lesson—little white children and little black children were not to play with one another. Martin decided then and there that something had to be done. And so he began the journey that would change the course of American history. This book looks at the early life of Martin Luther King, Jr., as seen through the eyes of his older sister. € What was young Martin Luther King, Jr.'s response when his mother told him about the world and the things some people believed? € Why did Martin and others want to end the laws that made life different for black people than it was for white people? € What makes a hero? € What did Dr. King want to change in the United States? € What can we do today to help make the world a better place? o Martin Luther King, Jr.'s father was a ________. o This book was written by his ________. o We know this story about Martin is true because____. € Begin your lesson on the life of Martin Luther King, Jr., by assessing your students' prior knowledge using a K-W-L chart: List on a chart the facts that your students know about King. Next, ask them to tell you what they want to know about him. After reading the book, have students tell you what they have learned about him. € Research events of Dr. King's life and times and perform a classroom skit or play based on the information gathered. € As a class project, publish a little book on the life of Martin Luther King, Jr.
€ Have students work in cooperative groups of two or three to make a time line called "the life of Martin Luther King, Jr." Each group should use an 18" x 24" sheet of paper to depict one part of Dr. King's life and accomplishments. € Have students write a newspaper account of the march on Selma, Alabama, or any other significant event in the life of Dr. King. € Discuss the significance of the Nobel Peace Prize. Award each of your students a Peace prize for their work toward getting along well with others or finding peaceful solutions to conflicts. € Point out to students that cities such as Atlanta, Georgia; Montgomery, Alabama; Memphis, Tennessee; and Washington, D.C., figured prominently in the life of Martin Luther King, Jr. Ask: What other places can you think of that are closely associated with Dr. King? Write the name of each important location on the chalkboard. Challenge students to research a variety of print and online resources to find information about each of those places. Tell students that as they locate each place of importance on a blank map, they should write a sentence or two of explanation about the importance of that place in Dr. King's life. When students complete their maps, provide a time for them to display their maps and share what they learned with their classmates. Christine King Farris is the sister of the Reverend Dr. Martin Luther King, Jr. and the only surviving member of the King family. She is the author of the children's book My Brother Martin and has been on the faculty of Spelman College since 1958. She lives with her husband in Atlanta. Chris Soentpiet (pronounced: soon-peet) is a recipient of a gold medal from the Society of Illustrators; has received accolades from the International Reading Association, Parents magazine, the American Library Association, the School Library Journal, the Chicago Tribune, the San Francisco Chronicle, and the Smithsonian; and has been recognized by the American Society of Portrait Artists Foundation. When not painting, Chris visits schools across the country promoting the love of children's literature and the arts. An honor graduate from Pratt Institute of Art, he lives in New York City with his wife. To learn more about Chris, visit his Web site at Soentpiet.com. "This outstanding book belongs in every collection." "A very welcome addition to the King story." "A delightful biography for children." "This is a rare glimpse of the activist as a young boy." "...glimpses of the home that nurtured King's dream." "Vividly recounted anecdotes show children how this great hero was once a kid like them." "Anyone -- especially kids -- can relate to the warm family scenes depicted in the book."